For a water filter to work well, the water needs an adequate “residence time” within the filter medium. The rate that water flows through the filter affects the filter’s effectiveness (the percentage of the contaminant it removes), the pressure drop (how much the filter reduces water pressure), the longevity of the filter medium, and, consequently, the cost of operation. We’ve taken the manufacturer’s performance data on a single filter cartridge to illustrate the interesting fact that by doubling the capacity of a whole house filter, installing two identical filters side by side, you more than double the value. The illustration above shows a whole house filtration setup using standard-sized 4.5″ X 20″ filter cartridges. The water passes through an initial sediment cartridge (sediment filters will handle much higher flow rates than equally- sized carbon filters) then the line splits to go through two carbon filters. 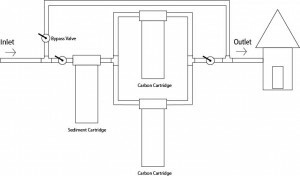 Each of the carbon filters, therefore, handles only half as much water, at half the flow rate, giving each cartridge double the residence time to do its work. 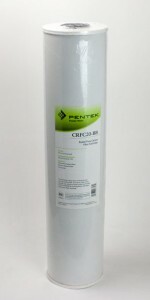 Single Filter @ 5.0 GPM Service Flow 2.5 psi 10,000 gallons $0.0168 -1 2/3 cents per gallon. 1 psi 25,000 gallons $0.0067 –2/3 cent per gallon. Parallel Installation of 2 Filters @ 5 gpm Service Flow 1 psi 50,000 $0.0067 –2/3 cent per gallon. The example given would serve a small family–2 or 3 people–living in a home with one or two bathrooms. The same proportions can be applied, however, to other types of treatment and other filter applications.The double filter setup also gives extra capacity should you needed it. Although the unit is sized for 5 gpm service use, it would easily accommodate a 10 gpm demand should the need arise. A word of caution, however, concerning tank-style backwashing filters. When you increase the size of backwashing filter, you also increase its backwash water requirement, plus oversizing can actually hurt performance. Tank-style filters actually have a minimum flow rate that should be observed. Pentek’s CRFC20-BB cartridge is a nominal 25 micron radial flow granular carbon cartridge that has minimal flow restriction. 10,000 gallons of chloramine reduction at 5 gpm; 25,000 gallons of chloramine reduction at 2.5 gpm; 200,000 gallons of chlorine reduction at 4 gpm. Pressure drop is only 2.5 psi at 5 gpm.